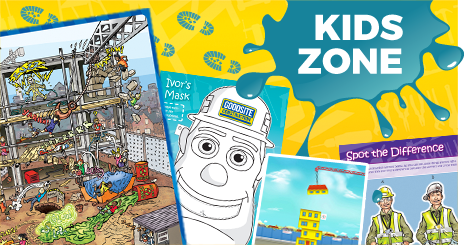 Ivor Goodsite and Progression Homes recently made a surprise visit to Wrington Primary School in North Somerset, to talk to the children about the dangers of construction sites and to explain why they should never play on or near them. 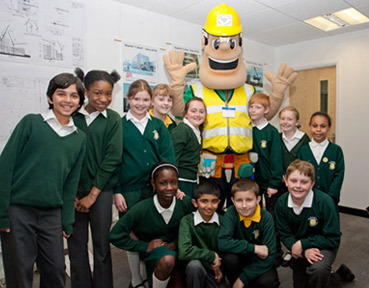 Steve Carey, Progression Homes’ Director, delivered an interactive talk, explaining why site personnel needed to wear the protective clothing demonstrated by Ivor, and asked the children what they thought each piece of protective wear was for, why it was so important to wear it, and what could happen if they entered a site without wearing it. 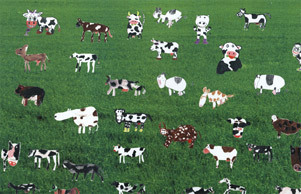 Every child in the school participated in the production of a giant mural, by painting their own picture of a cow grazing in a field. 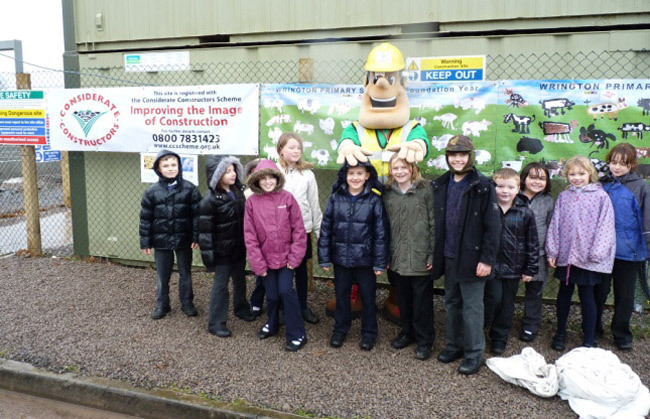 The pictures were then screen printed by Progression Homes onto seven, two metre long canvas banners and put on the site hoardings. The idea of the banners was to provide a pleasant outlook for the local residents living opposite the site during the construction period. The fields around the site had always had Friesian cows grazing in them, so the idea was to reinstate that pleasant view!